We are proud to announce that Juniper at Portola Springs Homeowners Association has selected Tinnelly Law Group as their association’s legal counsel. 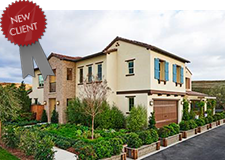 Juniper at Portola Springs is a brand new condominium community by Richmond American Homes. The latest addition to the Villages of Irvine®, Juniper at Portola Springs offers easy access to shopping, dining and the Irvine Ranch Conservancy—comprising 50,000 acres of open space, lakes and trails. Our HOA attorneys and staff look forward to working with Juniper at Portola Sorings’ Board and management.